What is the main phone number for the School of Nursing? What is the main phone number for the Admission and Enrollment Services? What are the hours of the Admission and Enrollment Services? How do I apply to the School of Nursing? High School students apply directly to the Admissions office declaring Nursing as a major. Students currently attending other universities or colleges apply to Undergraduate Admissions as a transfer student. Current UConn students wishing to change their majors must complete a “School Change Petition” form obtained from the School of Nursing. When does the upcoming academic year begin? Visit the Office of the Registrar Academic Calendar web page. What are the hours and the location for the Center for Nursing Scholarship? What are the upcoming events for the School of Nursing? Visit our Nursing Events web page. What is the mailing address for the School of Nursing? What is the mailing address for the Admission and Enrollment Services? What is the fax number for the School of Nursing? Visit the Bachelor of Science web page. Is it easier to get into SON upon high school graduation or after acceptance into the university? Students not admitted to the School of Nursing at the time of entry to the University may apply for admission through the School Change procedures. Such students should submit a completed school change petition form as well as a statement as to why they desire the School change to the School of Nursing. School Change forms are due by February 1st of the academic year for Fall acceptance consideration. Decisions will be based on several criteria including the applicants academic record, courses taken, and space availability. School Change applicants are normally expected to have a minimum cumulative GPA of 3.0 as well as math/science GPA that is equal or higher to be competitive. Do you have an MS program? What specialties are offered? Yes, UConn School of Nursing offers a Master degree program. Areas of study include the following: clinical nurse leader, acute care nurse practitioner, primary care nurse practitioner, and neonatal nurse practitioner or neonatal clinical nurse specialist. Visit the Master's Programs web page for more details. Is the course work the same for all BS students? Coursework follows the prescribed nursing curriculum (see sample curriculum). Students are able to choose electives to meet the general education requirements of the university based on their individual interests. Nursing classes range from 19–120 students depending on the individual course. A ratio of 1:8 is used during clinical practicum coursework. Is transportation provided to and from clinical sites? Is there a wide range of clinical sites available for students? A variety of clinical agencies/experiences are used throughout the clinical component of the curriculum to facilitate students being able to meet the learning objectives of a particular clinical practicum course. Acute care hospitals, extended care facilities, rehabilitation facilities, ambulatory settings, clinics, public health agencies, schools, hospices, senior housing and correctional facilities are examples of facilities used. Are transfer students admitted into the program? Transfer students are admitted to the School of Nursing on a competitive, space-available basis each year. Transfer applications are due to the Office of Undergraduate Admission by February 1st of each year preceding Fall admission. Are many classes taught by teaching assistants? No, the School of Nursing utilizes teaching assistants to supplement regular faculty teaching in didactic and clinical courses. Teaching assistants who are experienced Registered Nurses returning to school for graduate coursework are used to help undergraduate students in simulated laboratory learning activities. Are students able to focus in a general area when receiving their BS? 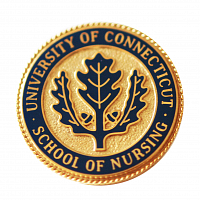 The UConn SON nursing curriculum is designed to prepare beginning practitioners as generalists and prepares students for the RN-CLEX licensing exam to become a Registered nurse. Honors students can complete an honors project under the guidance of a faculty member.